Among the gloomy, unassuming industrial area of East Lansing, Michigan, seven-hundred people pack in to celebrate with a brewery looking to bring a little bit of the East Coast to the “mitten-state.” It’s only been a year since Ellison Brewery and Sprits first opened their doors to the public, but after their first bottle release, co-owners Aaron Hanson and Eric Elliot have made their intentions clear. They want to become the kings of hoppy beers in the state of Michigan. While Eric first became acquainted with beer as a distributor in Michigan, Aaron spent his time overseas, picking up the hobby of distilling spirits. When the two reconnected back in the states, they decided to bring together their love for beer and spirits and wrote their first business plan in July of 2014. 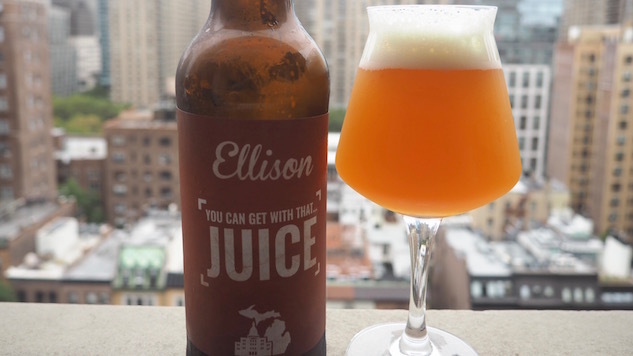 One year later, Ellison Brewery and Spirits became a reality, culminating with their first bottle release, “You can get with that…JUICE,” a double IPA brewed with a blend of hops. The beer pours out of the bomber a bright orange color, giving off a thick white foamy head. As the foam begins to dissipate, it leaves a thin white lacing around the edge of the glass. The nose is straight in-your-face orange zest, and citrus. The mouthfeel follows the nose, though the hop bite up-front is more tame than your normal East Coast hop-bombs. This isn’t the beer that’s going to give you that all-out assault of hops on your palate. I get the sense that Ellison held back, creating a more subtle interpretation of the “East Coast IPA.” It’s approachable. Following that initial bite is a lingering orange taste, reminding me of what you get with Tree House’s Julius. For their first bottle release, it’s clear Ellison is going to be around a long time, but don’t get used to the bottle format. Ellison expects to release an assortment of hops to locals late next month in cans. Jason Stein is a New York-based beer nerd. You can find more of his writing on NYC Beer Society.